Inference of gene regulatory networks (GRNs) requires accurate data, a method to simulate the expression patterns and an efficient optimization algorithm to estimate the unknown parameters. Using this approach it is possible to obtain alternative circuits without making any a priori assumptions about the interactions, which all simulate the observed patterns. It is important to analyze the properties of the circuits. We have analyzed the simulated gene expression patterns of previously obtained circuits that describe gap gene dynamics during early Drosophila melanogaster embryogenesis. Using hierarchical clustering we show that amplitude variation and defects observed in the simulated gene expression patterns are linked to similar circuits, which can be grouped. Furthermore, analysis of the long-term dynamics revealed four main dynamical attractors comprising stable patterns and oscillatory patterns. In addition, we also performed a correlation analysis on the parameters showing an intricate correlation pattern. The analysis demonstrates that the obtained gap gene circuits are not unique showing variable long-term dynamics and highly correlating scattered parameters. Furthermore, although the model can simulate the pattern up to gastrulation and confirms several of the known regulatory interactions, it does not reproduce the transient expression of all gap genes as observed experimentally. We suggest that the shortcomings of the model may be caused by overfitting, incomplete model description and/or missing data. A biological system that has been extensively studied is the segmentation mechanism of early development in Drosophila melanogaster (see  for review). At early stage, a cascade of maternal and zygotic genes is activated in the syncytial embryo that subdivides the ectoderm into smaller domains. First, maternal morphogenes such as bicoid (bcd), caudal (cad) and hunchback (hb) activate zygotic gap genes such as hb, giant (gt), Krüppel (Kr), knirps (kni), or tailles (tll), which in turn will activate the pair rule genes. The pair rule genes will regulate segment polarity genes and Hox genes, which both control the differentiation of each segment of the future embryo . The gap gene circuit has been extensively investigated using mathematical models [2, 3]. In all cases, the goal was to derive the regulatory interactions that control gene expression. The gene circuit approach  combined with a parameter optimization method allowed to infer gene regulatory interactions directly from experimental spatio-temporal gene expression data [5, 6]. In all cases the optimization involved minimization of the difference between observed data and simulated data. Previous studies [4, 7, 8] have analyzed the obtained gene circuits essentially by visual inspection of the simulated patterns, mainly because of an insufficient number of circuits. Fomekong et al. proposed a faster optimization method that yielded a higher number of circuits, allowing for a more detailed analysis. Finding a set of parameters that reproduces the observed data does not necessary imply that the network structure has been identified correctly, or that the underlying pattern formation mechanism of the system has been revealed [9, 10]. 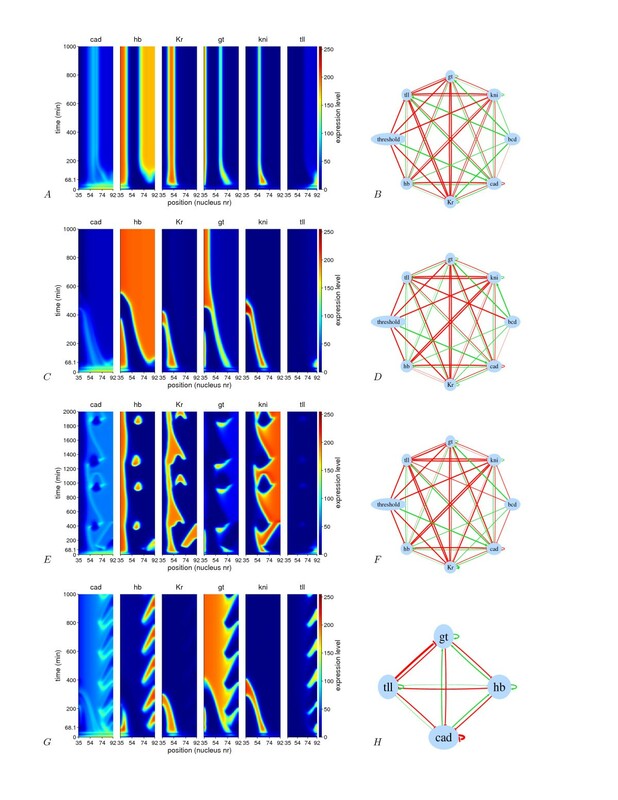 For some systems, the network structure itself inherently leads to robust pattern formation and is weakly depended on the specific parameter values [11, 12]. Inference may lead to a unique network, however for many cases many circuits with different topologies and scattered parameter values are found. It is necessary to further analyze these circuits and discriminate between realistic and non-realistic circuits based on other criteria [13, 14]. We have analyzed the simulated patterns and parameters of the circuits that were obtained previously using descriptive statistics and stability analysis [8, 15]. The incompleteness of the available experimental data, the complexity and the non-linearity of the model and the large number of unknown parameters potentially leading to over-fitting makes the reverse engineering problem challenging. It might lead to circuits with different regulatory interactions or variability in the simulated patterns and dynamical behavior. 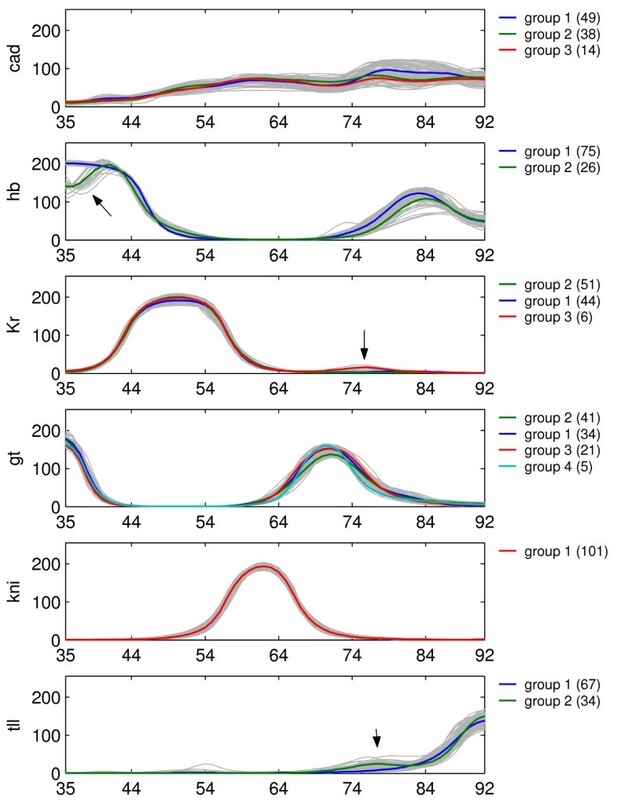 Although all circuits show relatively good fits with respect to the data (see Figure 1), small features, like bumps, dips and other variations in the expression profiles at gastrulation time are observed (see Additional file 1). These features are not observed in the data, and may represent circuits that are not biologically realistic. We performed a hierarchical cluster analysis on the profiles to identify groups that share deviant features. By statistical comparison of the parameters among the different groups using a T-test we find parameters that may explain the observed features. Expression profiles of the 101 gap gene circuits at different time points. Individual gene profiles are shown in light gray and the average profile of that gene at a specific time point is plotted using a colored solid lines. The x-axis corresponds to 35-92% of the A-P position and the y-axis describes the expression level influorescence units. Each panel corresponds to one of the 10 time points (12, 13 and 14A1-14A8) for which data are available. The experimentally measured expression profiles are plotted using colored dashed lines. Figure 2 shows the clustered simulated profiles where we observe four main pattern groups described as follows: group 1: no defection. group 2: hb showing a dip in the anterior domain. group 3: tll showing a shoulder. group 4: Kr showing an extra bump. Hierarchical clustering of simulated profiles at T = 68.1 min. The mean expression profile of the groups obtained from clustering are shown using colored solid lines. The individual expression profiles of each circuit are shown in gray. We noticed that some of the clusters share the same circuits as shown in Figure 3. We observe that the group with the hb-anterior dip largely overlaps with the tll bump cluster and also with one of the gt clusters. This means that the features in hb, tll and gt share a common circuit topology (see Venn-diagram Figure S1 in Additional file 1). 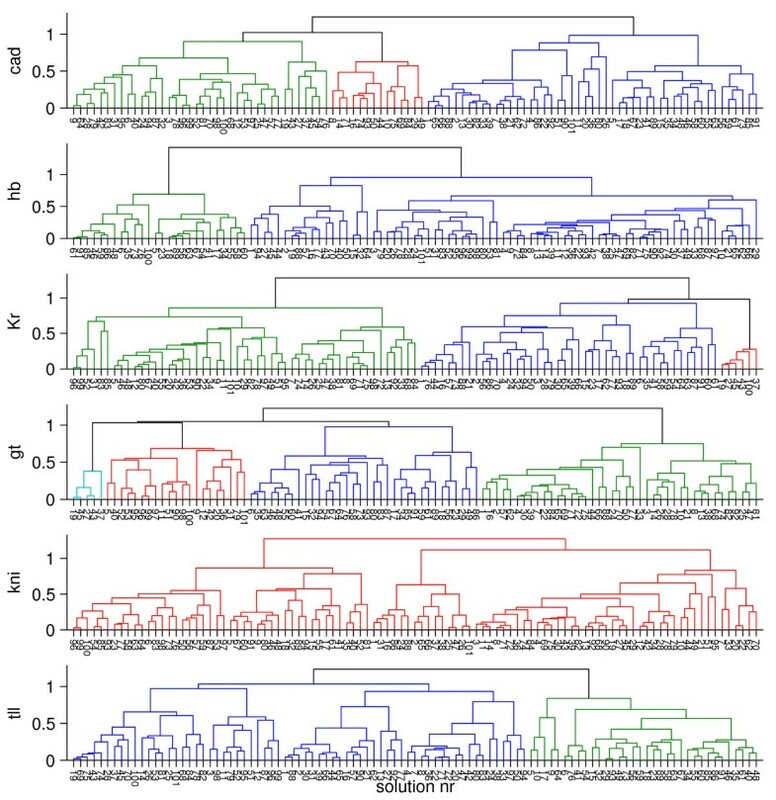 Dendrograms obtained from hierarchical clustering of the simulated profiles at T = 68.1 min. Each Individual tree diagram corresponds to the distribution of all the profiles obtained from the different circuits for a single gene. In each tree, the circuits belonging to the same cluster are grouped. The differences between the profiles may be explained by variability in circuit topology or by differences in parameter magnitude. By comparing the parameters of the different groups using a T-test, we find that parameters of group 2 and group 3 do not show any significant differences, and therefore are combined into one group 2-3. Comparison of group 1 and group 2-3 yields three parameters: (Table 1). In Group 2-3 Gt represses hb and causes the anterior hb dip. Also, tll activation by Gt is considerably decreased, leading to higher production of tll, which causes the tll-bump. Comparison of group 1 and 4 shows that Kr autoactivation is strong and repression by Gt is weak within group 4 (Table 2). This combination causes a local increased production of Kr on the domain where Gt is expressed. A consequence of the strong autoactivation would be a higher level of Kr all along the A-P axis. This is prevented by increased repression through Hb and Kni. Also, the weaker production rate of Kr compensates for the strong autoactivation. Parameter differences between circuits of group 1 and circuits of group 2-3. T-test comparison of circuit parameters belonging to a group with a normal pattern without any defection (group 1) and a solution for which hb has a dip and tll a bump (group 2 and 3). In groups 2 and 3, Gt represses hb, causing the dip observed at anterior hb. Also, Hb activates gt (contrarily to group 1). Consequently, there should be an increased production of anterior gt and something should locally repress gt to keep it at its normal level. At this position, Tll is the gene that controls gt expression level, and one way to keep it constant would be to increase the repression weight. Parameters' differences between circuits of group 1 and circuits of group 4. T-test comparison of solution parameters belonging to a group with a normal pattern without any defection (group 1) and a solution for which Kr shows a posterior bump (group 4). During gastrulation most of the gap domains, maternal bcd and cad disappear within 30 min. The anterior hb domain disappears rapidly during gastrulation , while posterior hb domain can still be detected for a few more hours until the end of germ band extension . Central Kr domain decays rapidly after the onset of gastrulation [18, 19]. Posterior gt domain disappears rapidly during gastrulation while the anterior domains persist for a few hours but change quite drastically and become involved in organ formation [20–22]. The entire kni domain and the posterior domain of tll disappear rapidly after gastrulation [23, 24]. (a) 9 circuits show a rudimentary gap gene pattern with all gene domains more or less well defined. (Figures 4-A, B). 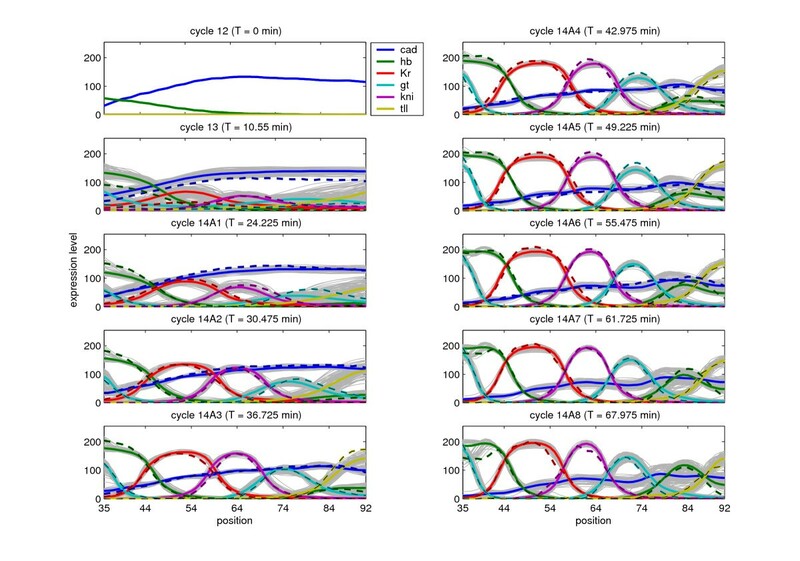 Spatio-temporal surface plots showing the behavior of four different circuits at later times, and on the right the corresponding circuits. Surface plots (panel a, c, e and g) represent the main types of patterns observed: a) Stable pattern with reminiscent pattern (Group I). c) stable pattern with a large hb suppressing all genes except gt (Group II). e) Oscillatory pattern where all genes except Tll oscillate (Group III). g) An oscillatory pattern where all genes except Kr and kni oscillate at the posterior (Group IV). In panel h the reduced circuit is shown. Only the connections that correlate with this particular pattern are shown. In this circuit typical oscillatory motifs can be recognized. Edges between two vertices indicate activation (green) or repression (red). The edge thickness is proportional to the absolute weight of the interaction. (b) 27 circuits develop an uniform hb domain that covers the whole embryo. (Figures 4-C, D). (c) 28 circuits show variable stable patterns with expanding or disappearing domains. (a) 18 circuits with cad, hb, gt and tll showing posterior oscillations, while Kr and kni domains disappear. (Figures 4-E, F). (b) 19 circuits where all genes oscillate but tll, which disappears (Figures 4-G, H). We have compared parameters using T-tests and the average circuit topology (see Table 3, 4 and 5). From Table 3, we see that the main difference between the two stable patterns is the strong hb autoactivation in the group with expanded hb. In some of the oscillatory circuits (Figure 4-H), we observed a basic motif composed of autoactivation and negative feedback loops. It can be shown theoretically that the minimal requirement for oscillations to occur in a two-gene network is that an activator activates its repressor and also itself. Nevertheless, the positive and negative feedback loops may be indirect and also the actual parameter values may prevent the formation of oscillations even if the minimal requirement for oscillations is present. In the first oscillatory group we observe the basic motif for oscillation between Hb and Gt (Figure 5-H). In the data we observe that the anterior hb peak slightly collapses, however it collapses more at the position of the anterior gt peak. In a number of circuits the fit to Hb is improved by repression of hb by Gt (group 2 cluster analysis). Almost all members of this group show oscillations. Hb in this group has an intermediate autoactivation (the group with strong autoactivation does not show oscillations) and Cad activates hb leading to constitutive activation of posterior hb. Next to the hb-gt oscillatory motif we see similar motifs with Tll. When negative feedback interactions are removed we observe that the corresponding gene does not oscillate any longer. Although the connections in these motifs are weak the behavior at later times is strongly affected. Comparison of an average network with stable pattern formation(group I) against a network with a stable pattern and with expanded Hb domain (group II). Comparison of an average network with a stable pattern group (group II) against oscillatory pattern (group III). Comparison of an average network of the two groups with oscillatory pattern (group III vs. group IV). Parameter correlation matrix. Left: Matrix showing the pairwise correlation; the colour scale goes from intensive red (strong negative correlation) to bright green (positive correlation). 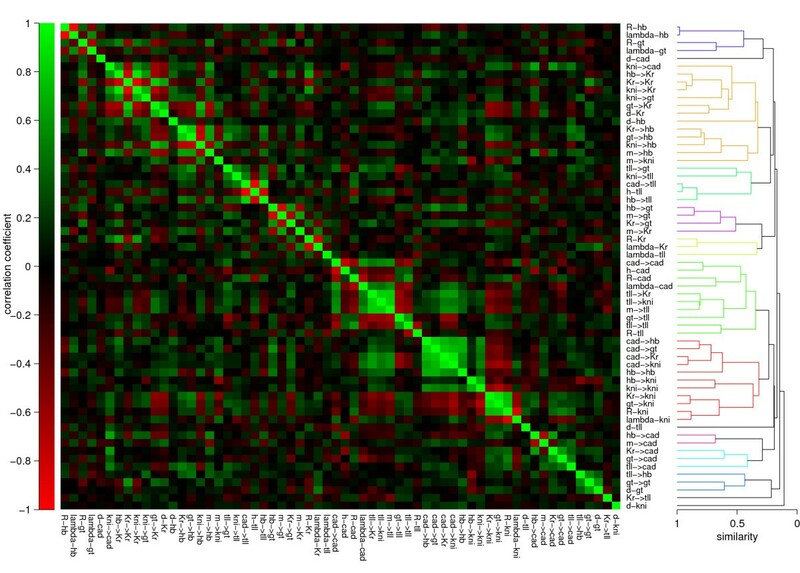 The correlation matrix shows that there exist many pair wise correlations that tend to form clusters. Right: The absolute value of the correlation coefficients are used as a similarity measure to cluster the parameters, which is presented as a dendrogram. The parameters are sorted according to the dendrogram. From the two previous analyses and T-tests, we see that parameters differ from circuit to circuit leading to different behaviour. This might be a sign of overfitting, which can be determined by looking at the correlation matrix of all the parameters (Figure 5). Because of compensation mechanisms parameters may not be identifiable. Examples of these are promoter and decay rates, which both scale the expression profile. Furthermore, the input weights on a single gene can also compensate each other. If a positive input on a gene becomes stronger, increasing negative weights or decreasing positive weights can adjust for the increased total input, such that the total input on that gene is not altered much. However, these correlation patterns may be more intricate [see Additional file 1 for an extended correlation analysis]. 1. All the gap gene are activated by Cad. 2. All the gap gene but kni are activated by Bcd. 3. Hb, Kr gene have an auto-activation. These interactions are consistent with the regulatory mechanism proposed in  as well as those obtained in early literature [19-21, 25-29] and previous analysis . Out of all the circuits, only 4 have a very good patterns and the mentioned regulatory interactions [circuits 20, 31, 82 and 101, see Additional file 6]. The alternative interactions proposed by the other circuits are a consequence of overfitting, incomplete data and incomplete model structure. For example biological evidence suggests that the anterior hb dip is caused by different early and late regulation mechanisms, which is not included in the current model, consequently the optimization predicts for many circuits suppression of hb by Gt to mimic this data feature. Furthermore the model tries to reproduce the experimentally observed decrease of cad by introducing negative feedback through the gap genes. Jaeger et al. suggested that the anterior shift of posterior domains after cycle 14A is caused by asymmetric repression of the gap genes. All the current circuits reproduce the shift, but from the current analysis, it seems that the shift is not necessary a consequence of the asymmetric repression triggered by Hb. In many circuits we see that the shift of these domains continues to progress and leads to domain expansion or disappearance of other domains. The shift seems to correlate strongly with the posterior hb domain. The posterior hb domain develops later than the other domains, and represses gt, kni and Kr. In the circuits where the posterior hb domain continues to expand and in the end forms an almost uniform domain at steady state that covers the whole embryo; the anterior gt domain remains and Kr, kni, tll and cad all disappear. This phenomenon is caused by strong hb autoactivation, the other gap genes are not able to balance hb expression. The anterior gt domain remains because of maternal activation by Bcd and weak repression by Hb. Schroder et al. suggested that autoactivation is involved in maintenance of gap gene expression and sharpening of gap domain boundaries . Although this might be true, strong autoactivation also affects pattern stability later on during gastrulation, making it more difficult for domains to fade. The inability of the circuits to predict transient expression suggests that either an additional mechanism is missing in the model or that the optimization failed to capture the dynamics. Yves Fomekong-Nanfack, Marten Postma contributed equally to this work. This work was supported by the Netherlands Organization for Scientific Research, project NWO-CLS 635.100.010 ("3d-RegNet: simulation of developmental regulatory networks", http://www.science.uva.nl/research/scs/3D-RegNet) and by the EC (MORPHEX, NEST Contract No 043322). We used data from the FlyEx database http://flyex.ams.sunysb.edu/flyex/. We thank Dr. Johannes Jaeger for his wise suggestions. All authors participated in the design of the study, and wrote the manuscript together. YF-N and MP conducted the analysis of data and simulations, and made the figures. All authors read and approved the final manuscript.